Parenting comes with its own unique set of challenges—but when your children are out of sight these can feel magnified. 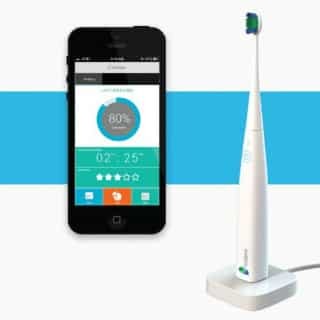 Fortunately, with new connected technology and devices for kids, these challenges can feel a little more in your grasp. Ever since cell phones became widely available and affordable, parents have had to struggle with whether, and at what age, to give one to their children. Smartphones make it even harder to decide whether the peace of mind of being able to stay connected, especially in an emergency, is worth the risk of giving a young child an expensive device with full access to the Internet, texting, and other capabilities. Enter FiLIP, a kid-friendly smartwatch that went on sale last month. It’s really more of a dumbwatch, actually: to the child, it’s a watch that can call up to five preset numbers and receive (but not send) short text messages. That’s it. No apps, no games, no music, no texting, no email, and no calling anyone the parents haven’t authorized. 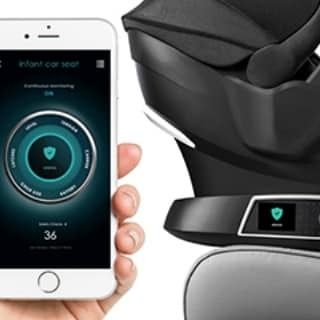 For the parents, though, FiLIP provides an easy way to stay in contact with their child, track their location (Utilizing a blend of assisted GPS, GSM cell tower and Wi- Fi hotspot triangulation), and know that the kid can reach trusted friends and family members when they need to. 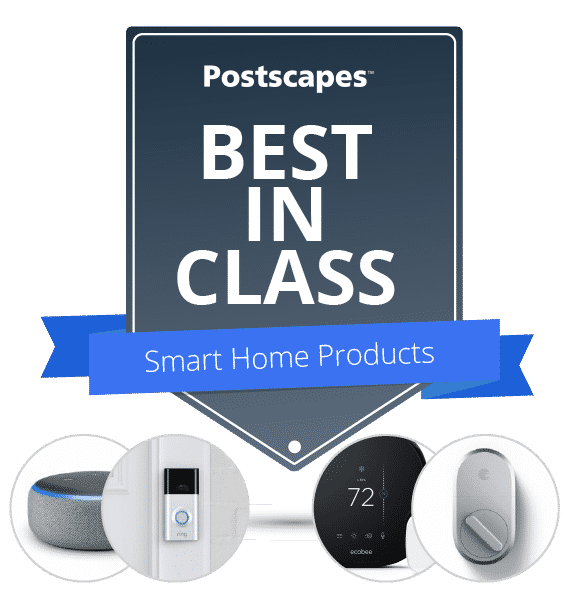 It’s all managed through a smartphone app, which lets parents assign numbers the child can call from the watch, and set safe zones so the watch can notify them when their child arrives at or leaves a place like home or school. Anyone with the FiLIP’s number can call it, but the watch never reveals its own number to the child, so parents can control who has access. The watch also has an emergency mode a child can activate by holding down a big red button on the side. This immediately pushes the watch’s current location to the parents, starts calling the preset numbers in order until someone picks up, and begins recording ambient audio. FiLIP is intended to make parents feel comfortable giving their children more autonomy to wander, explore, and make limited amounts of mischief without constant supervision. To that end, FiLIP’s design is rugged, water-resistant and kid-friendly. The strap is made of brightly colored flexible plastic, and the screen can be popped out to swap strap colors. A lot of parents have expressed concern over the strap itself, which slides on and off the wrist instead of buckling or locking in place. Some commenters on FiLIP’s Facebook page worry that it will be too easy to lose, or for a predator to remove it. 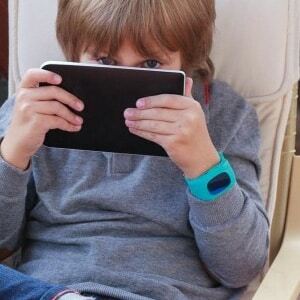 But the designers say kids are more comfortable with a watch they can easily take off for short periods, and that they’ll be more likely to enjoy wearing and using FiLIP if they feel a sense of ownership and empowerment via the device. Parents should also note that the watch uses a speakerphone, so calls may not be as private as with normal phones — though the designers say it’s a quiet speaker that must be held close to the ear. FiLIP is currently available in the U.S. through AT&T with a no-contract, $10/month plan (it doesn’t matter which provider you use for your own cell phone). Check out the video below to see if FiLIP might be a good fit for a kid in your life. 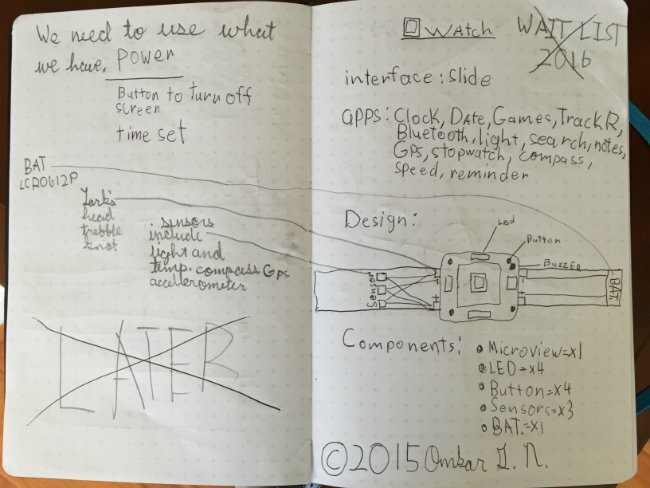 O Watch is a 3D-printed, programmable, build-it-yourself smartwatch designed for kids — by a kid. Though 8-year-old Omkar has had the support of his tech-industry parents and other mentors, hand-drawn design sketches show that he is ultimately the one driving the project. 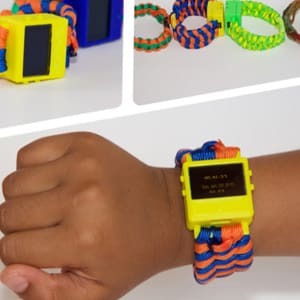 Inspired by another child entrepreneur (Quin Etnyre of Qtechknow), Omkar set out to create an open-source smartwatch kit that would get other kids excited about electronics. Along the way he partnered with TinyCircuits, which has adapted its TinyScreen module to create an Arduino Zero-based board with a color OLED screen and micro USB port for charging and uploading programs. That forms the core of O Watch, while a second board adds temperature, humidity and barometric pressure sensors, plus a 3-axis compass. Assembling and programming the watch are both relatively simple procedures. The parts snap together into a 3D-printed case, and users can add a touch of customization by making their own watch strap from a variety of materials. Programming is handled through the Arduino development environment. The O Watch website will offer downloadable case designs and example code for basic apps like telling the time. As part of the TinyDuino ecosystem, O Watch is compatible with lots of existing software from the developer community — and with additional hardware modules from TinyCircuits and other sources. So anyone who wants to make it a “true” smartwatch by adding Bluetooth or Wi-Fi connectivity will be able to do so pretty easily. More and more companies are realizing that kids have an integral role to play in the development of the Internet of Things. 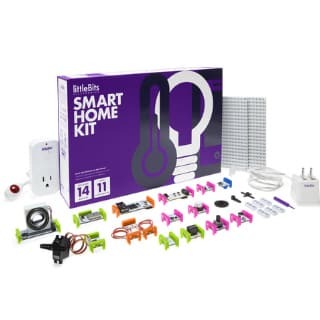 On the one hand are retail products that package connectivity and intelligence in a developmentally-appropriate form factor and UI — including kids’ smartwatch like Filip and Jumpy, as well as social or educational toys like Toymail, StoryHome and the CogniToys Dino. 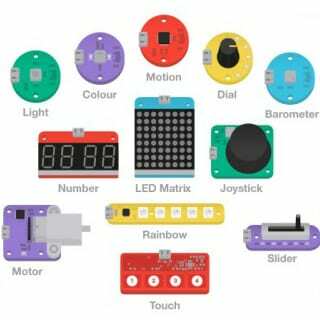 On the other are DIY kits that make prototyping and coding fun and accessible, such as Flotilla and Jewelbots. But the fact that an 8-year-old can not only use, but actually invent and direct a project like O Watch is a true testament to the democratizing power of these increasingly affordable and accessible technologies — and to the ingenuity of the youngest among us. O Watch can be pre-ordered on Kickstarter through Oct. 3, and kits should start shipping in February 2016. 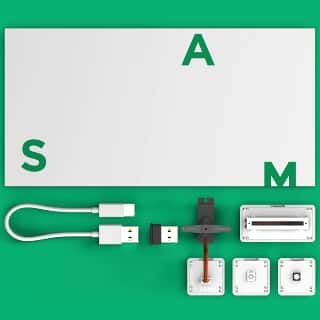 Watch the video below to learn more from Omkar himself, and check out his previous technology projects at IoT4Kids.com. One of the signature toys of the 1980s was Teddy Ruxpin, a stuffed bear that could “speak” by means of an animatronic face and an embedded cassette player. 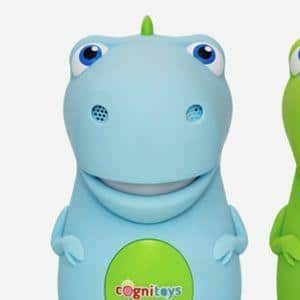 Today’s equivalent is the CogniToys Dino, which lacks the robotic movement but is capable of holding dynamic and educational conversations thanks to the power of IBM’s Watsonplatform. As a physical toy, the cartoonish green dino is a little underwhelming. 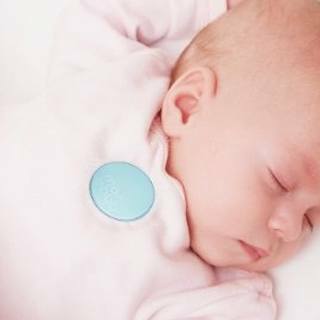 No moving parts — just a single button on its belly, which lets kids talk to it. But the magic is in the dialogue that occurs when the dino starts to talk back in a voice reminiscent of a certain fuzzy blue cookie aficionado. A Wi-Fi module connects the toy to the cloud, where Watson’s “cognitive computing” power is applied to CogniToys’ speech recognition algorithms and education platform. Natural language processing is one of the toughest nuts to crack in all of computer science, as anyone familiar with the frustrations of Siri or “OK Google” knows. But if Watson’s successes at chess and Jeopardy! are any indication, holding a coherent conversation with a first-grader could be just within the realm of possibility. When a kid first says hello, the dinosaur might start out by asking about their favorite color, favorite toys or other interests. 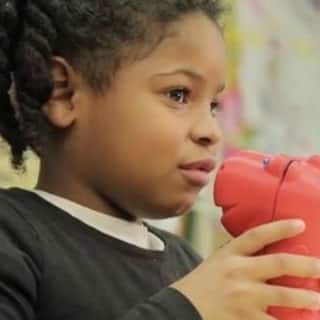 It will use these to personalize its speech while carrying on a dynamic conversation that can lead into interactive storytelling, rhyming or numbers games. As the toy gets to know its child, the software picks up on clues that signal the kid’s stage of cognitive development. Then it draws on a database of learning games and activities, as well as the history of previous interactions, to engage the child in a conversation that’s fun, educational, and developmentally appropriate. Parents seem to like the dialogue-based interaction, which preserves an element of imagination in play and learning. They can use a web-based dashboard to provide additional information about their child, check in on the kid’s progress through various educational modules, and choose content priorities to steer the conversation in a certain direction. The first version of the dino, which can be preordered on Kickstarter through March 18, will run on four AA batteries with enough juice for about two months of intermittent playtime. Later versions of the toy may have rechargeable batteries, new designs and other features.  And because the software that directs the conversation lives in the cloud, updates to improve the algorithms and add content can be made at any time. Elemental Path , the company producing the CogniToys line, won the grand prize in the IBM Watson Mobile App Developer Challenge last year with a prototype app (then under the name Majestyk Apps). The technology that powers CogniToys grew out of that work, and could be extended to other toys down the road. Learn more about CogniToys in the video below.